The Z program is a great way for Teens to expand their knowledge of Arts & Culture, Fashion and Music, network and Earn Money. 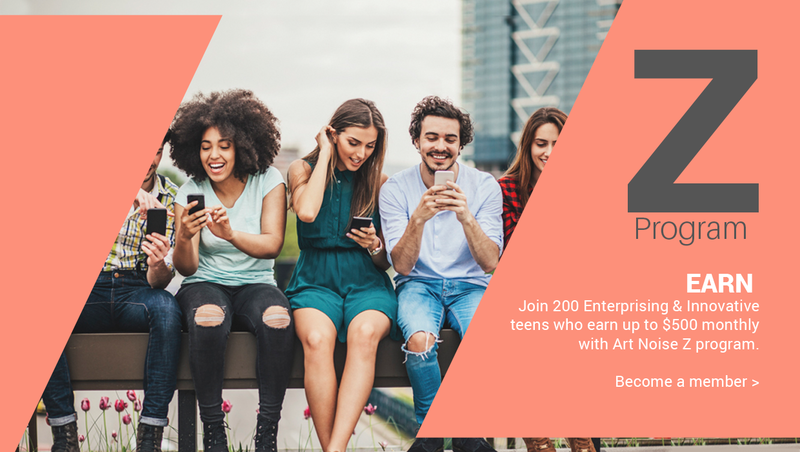 Art Noise Z Program aims to provide a social and intellectual introduction to the world of arts and cultures and give teens a way to leverage their social Influence to earn money. Whilst having fun, the Z Program encourages teens to be entrepreneurial, grow their social influence, and engage in community development projects. In addition to their own event, Z Program Members can also attend Art Noise events and apply for free tickets to many national arts, Fashion and Music events. Art Noise Z program holds a yearly networking conference for teens with interests in arts, fashion & Music. Details of the conference will be forwarded to members. To be a member of Art Noise Z program, you need to be under 18 years and annual membership costs only $5. $10 on every order made using member’s custom coupon code. Please note Membership is for Teens aged 13 -18 only.